A lot of us were used to see a dog or a cat with their owner in the park or climbing the mountains, but this story that went viral on the internet is a different one. A guy who owns ducklings brings them into the woods for hiking. The little ducks were so eager to walk with their little feet and follow their owner as they climb the mountains and wherever the man go they follow without hesitation. 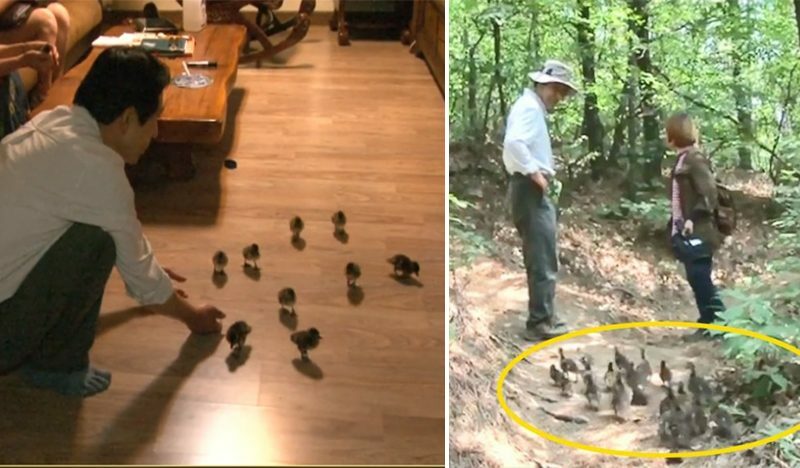 This Korean man in his middle age has been taking care of the twenty-one ducklings since they were eggs. He is the one who carefully heats the eggs so that they hatch properly and that the little ducks would come off the shell alive. Since birth, he is on hand with taking care of the ducklings and he considered them as his own children giving them what they need to survive without a Mommy duck. He said in an interview that one day he saw the ducklings bored and just roaming around his yard, so he decided to take them for hiking into the woods. His purpose is for them to be trained in going outside the woods and also it is a good exercise for their little feet. At first, he is hesitant to do what he had planned because he is afraid that they may die or they will not follow him, but it is not what happened. The ducks have enjoyed their trip from home into the woods and back home again in their house in Seoul, Korea. There is no doubt that this man is the one who brought up these little ducks because they follow wherever he goes. It is like they were thinking he is their mother! What beautiful scenery to see that a human can love not only dogs or cats but also ducklings.